The Chanson G2 Counter top ionizer faucet is the perfect addition to almost any countertop ionizer. In addition to its great looks and high quality, it allows direct connection to cold water supply from below the sink and frees up your main faucet from hoses and diverters. Chanson G2 acid faucets are also ideal when using triple canister pre-filters that are preferably placed under the sink, easily allowing pre-filters to be connected. 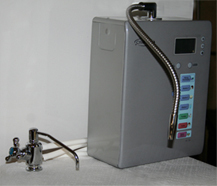 The G2 ionizer faucet has its own flow control valve that serves as the “on/off” switch for the ionizer and allows for fine adjustments to Alkaline and Acid water. The alkaline water still comes out the flexible spout on the counter top unit, but instead of the acid water coming out of a hose, it comes out of the spout on the Chanson countertop G2 faucet. The G2 also makes it really easy to turn down the flow and get that prized super strong acid water! In addition to Chanson ionizer, the G2 faucet will also fit the Kangen water ionizer, the Enagic water ionizer and the SD 501 water ionizer. *Faucet install requires a 1/2″ inch to 5/8″ hole. 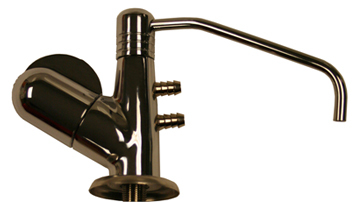 Get your Chanson Countertop G2 Faucet Now!